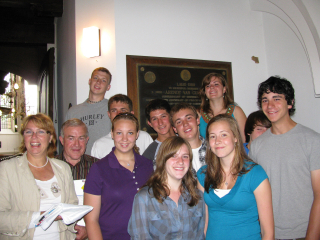 Below you can find the program of the youth exchange. A report a particular day you can find by clicking the date in the program. 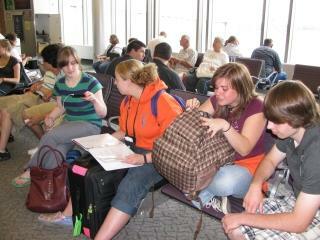 July 22, Wednesday Spend last day with host families. 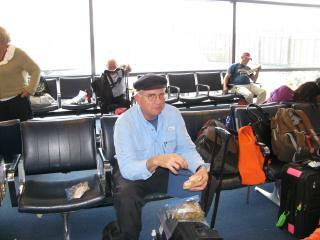 After a good flight from Albany/ New York they arrived at Schiphol Airport/ Amsterdam. Members of the counsel picked them up and brought them to Nijkerk. The reception was in the Townhall. 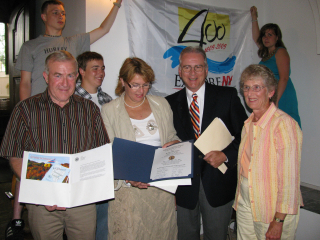 Mayor G.D. Renkema welcomed them and wished them a good time in Nijkerk/ Netherlands. 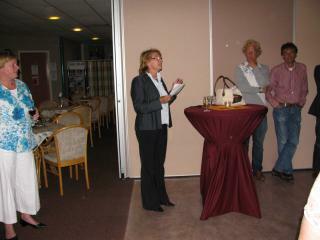 All the guests received a polo with the logo of the municipality of Nijkerk as present. After the reception the guests and host families made acquaintance with each other. 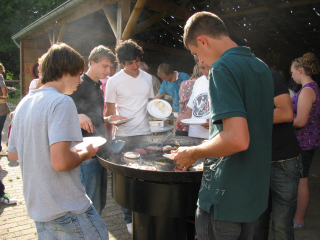 In the evening in the Community Center Corlaer there was a Potluck Dinner, offered and prepared by the host families. 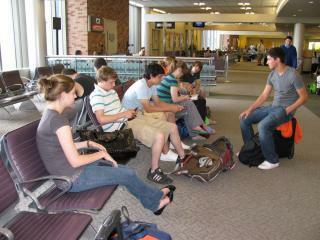 The atmosphere was cosy, it was a good opportunity to get to know each other better. The evening was successful and the dinner tasteful. This day has been used to make further acquaintance with the City of Nijkerk. It started with a visit to the Town Hall and a visit to the Historic Museum “Oud Nijkerk” (Old Nijkerk) where a great deal of the history of Nijkerk has been made visible. This comprised a visit to the “Grote Kerk” (The Church) which included the climbing of the church tower. On top one could enjoy the view over Nijkerk and the music of the Carillon. The tour through Nijkerk ended with a visit of the Regent’s Chamber of the former Orphanage Meilust . Efteling. This was a visit to the Amusement park “De Efteling” A lot of fairy tales of Grimm and Hans Christian Andersen can be found in this park. There are also a lot of different activities such as a ride with a train through the park or a ride in a Roller Coaster. Everybody (including the grown ups) enjoyed this day with extremely good weather. 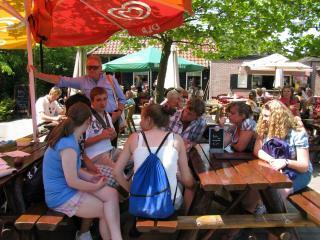 By bike they went from Nijkerk to Flevoland (the New Land, so they were riding on the sea bottom) to visit the Eemhof. The Eemhof is covered swim paradise with a lot of all kind of funny activities. 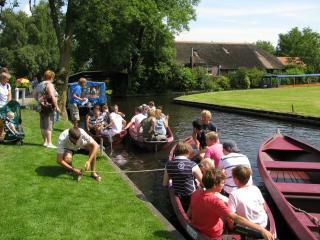 Giethoorn. Giethoorn is a small village, located in water area. Some of the houses can only be reached by “punter”, a special boat locally used. Even now freight is transported by boat. Under extreme good weather conditions the group was able to sail the canals and got a good impression of this Water Area in the Netherlands. This day was used to make a tour by bike through the surroundings of Nijkerk. The first stop was at Edith Terscheggets place. After a rest they played a game of “Boeren Golf” (Farmers Golf). In the afternoon to do some shopping they went by bike to the city of Barneveld. The day was ended at the farm of Edith with a BBQ. Amsterdam. By train the group went to Amsterdam. 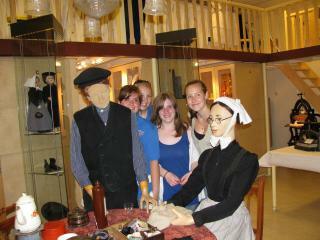 At first a visit was made to the House of Anne Frank. 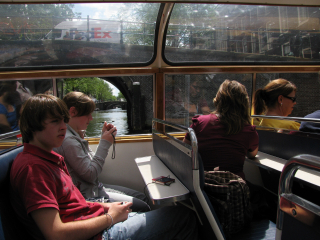 After this and a lunch in a Chinese restaurant a boat tour through the canals of Amsterdam was made. In this way an impression was given of Amsterdam in the 16th and 17th century. After the boat tour everyone was free to do some shopping and experience Amsterdam as a shopping centre. After a pleasant day, with packages, we returned to Nijkerk by train. Enkhuizen. First a visit was made to the city of Volendam, a harbour for fishing boats. 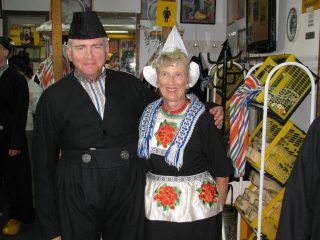 Everybody was able to dress him/ her in the traditional clothing of this village. 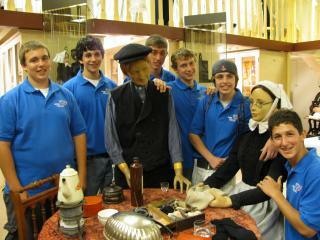 A picture was made of the whole group. 100 years ago, in July 1909 a group from Schenectady with Dr. W.E.Griffis came to Nijkerk. 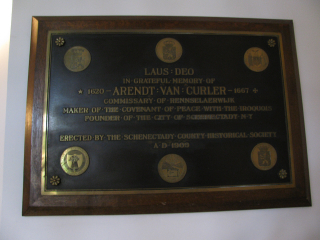 They unveiled a brass plaque in honour of Arendt van Curler, “Commissary of Rensselaerswijck, maker of the peace convenant with the Iroquois, founder of the city of Schenectady”. This was the reason to have a ceremony in the “Grote Kerk” on July 22nd. For the ten young Americans this was the formal conclusion of their stay with the host families in Nijkerk and in this way they could show their “thank you” to the people of Nijkerk for their hospitality. A day to say good-bye to your new family.